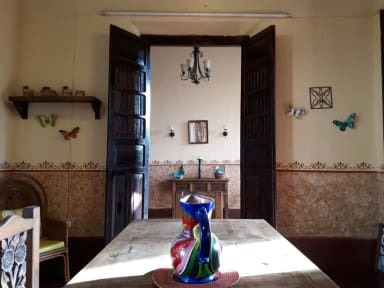 Casa Maryposa is a cozy and functional lodging where the guests and travellers will find not only a magnificent environment and experience, but also the very best of Merida and Mexico. We have an ample experience in the hospitality sector as well as a great knowledge about the city, elements that we capitalize to offer the very best of our facilities to our guests and travellers. We are located in the heart of the city in one of the most privileged neighborhoods of the Historic Center, very close to the Paseo de Montejo, local markets, restaurants and endless coffee shops. 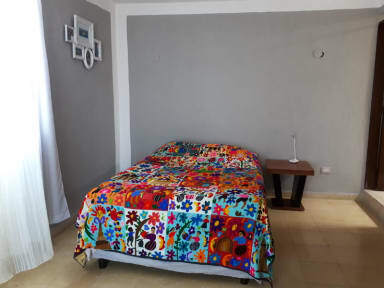 Located on St. 62, Casa Maryposa preserves its tranquility and harmony when crossing the door to find very colorful and Mexican spaces where you will enjoy equipped kitchen, entertainment room, pool table, table tennis, large hammock dining, among others. We have a shared room with bunk beds for 4 or 6 people with bathroom inside the room or dormitory of 8 people with exterior bathroom. The private rooms can be one or two double beds with private bathroom inside. In addition, we have several common areas where the guests and travellers will be able to exchange past experiences and future plans. That place was what i was looking for! Relaxing, quite, you can ride, play yoga, take a walk near the centre o lose your self in the Merida’s street! For breakfast you have eggs and some typical Mexican food!! The house is an amazing characteristic Patronal house of Merida, you can fill the vibes of How people from Merida lives! If i will come back, i’ll will come back hear! And the owner really polite!